The Oilers were not expected to finish at the bottom of the league, but injuries and some internal strife conspired against them this season. The good news is that the Oilers prospect cupboard is anything but bare. The list of high level prospects below will also receive another boost, as Edmonton will add either Taylor Hall or Tyler Seguin with the first overall selection at the 2010 Draft in June! 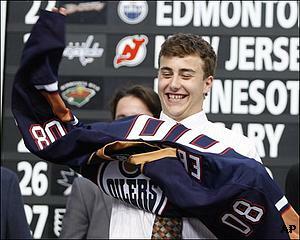 Jordan Eberle, C - #22 overall 2008 Draft. Not the biggest, strongest or fastest guy on the ice, just one of the best at every level so far in his career. Coming off a great season in Regina, Eberle was fantastically effective at the WJC for Canada and played at a very high level in eleven games at the AHL level. No pressure, but think Canadian Patrick Kane. Magnus Paajarvi-Svensson, LW - #10 overall 2009 Draft. Known for his elite skill set, acceleration, and particularly for his ability to make plays at top speed. Reports say that he has improved his defensive awareness, which had been the lone knock on his game. Played very well for Sweden at the WJC, and although he hasn't had eye-popping goal numbers he did have the most goals for any junior-aged players in the Swedish Elite League. Jeff Petry, D - #45 overall 2006 Draft. All-around skilled defenseman who can shutdown opponents, provide offensive support and play with an edge. Good size with nice hands and accurate shot. Learning with an elite program at Michigan State. Will be ready for the NHL sooner rather than later. Alex Plante, D - #15 overall 2007 Draft. Intimidating, monster-sized blueliner. At 6'5", 225+ lbs. it's no surprise that he can play the body and has a hard shot. He will bring a physical presence to a team more known for their smallish, quick, skill players. Linus Omark, LW - #97 overall 2007 Draft. Undersized Swede, with a penchant for the pretty play. Lightning quick, waterbug, with hands and masterful creativity. Has been an effective scorer in his first season playing in the KHL. His skill has made him a You Tube sensation. Check him out! While the first pick of the 2010 Draft is being contemplated by the front office in Edmonton, let us throw in our two cents and tip the scales of favoring Taylor Hall for the pick. As opposed to Seguin, a center, Hall is a right wing and would complete the Oilers first line of the future with Eberle at center and MPS at left wing! The positive side of Edmonton's dismal season is that all the injuries allowed them a free preview of some of their younger talent, particularly their goaltenders when Khabibulin went down. Although their statistics were not spectacular, Jeff Deslauriers and Devan Dubnyk proved that they could play at the NHL level. With better talent in front of them, they could win regularly.